Thank You for Supporting the Lloyd Center’s Annual Appeal! 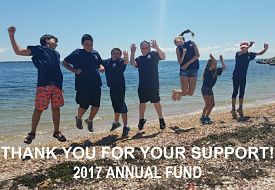 We would like to thank everyone that has made an annual gift to support the Lloyd Center’s efforts to bring outstanding environmental science programs to thousands of students every year, … to allow our research staff to continue their work monitoring threatened and endangered species, and major threats to the fragile environment of this area … and to allow us to offer our free Dartmouth, MA Visitor Center / 82-acre preserve to over 25,000 visitors a year. Your support of our Annual Appeal ensures that the Lloyd Center can continue to provide inspirational environmental education experiences for students and visitors of all ages.